The 2014 Zenica mine disaster was a mining accident occurred on 4 September 2014 at a coal mine "Raspotočje" in Zenica, Bosnia and Herzegovina. After a 3.5 Richter earthquake hit Zenica on 4 September 2014 caused rock burst in coal mine "Raspotočje", 34 miners remained trapped inside the mine. All miners were trapped more than 500 meters below the surface, but were provided with fresh air. Out of 34 miners that were trapped inside the mine, 5 were killed, while the remaining 29 were slightly injured. ^ Varandani, Suman (5 September 2014). "Bosnia Mine Accident: 34 Coal Miners Trapped After Gas Explosion From Minor Earthquake". International Business Times. Retrieved 5 September 2014. 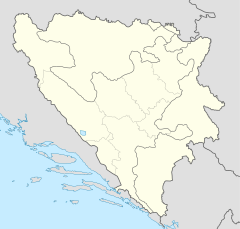 ^ "Bosnian Mine Accident: 29 Rescued, 5 Miners Buried". Nikšić, Sabina; Čohadžić. Amer. ABC News. 5 September 2014. Retrieved 5 September 2014.